Sister Simone Campbell is a Catholic nun, lawyer and founder of the Network Lobby for Catholic Social Justice. 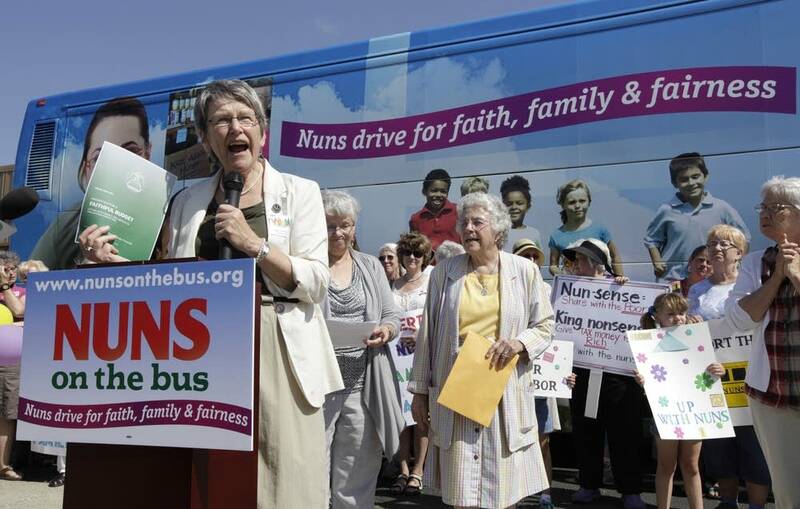 She was one of the Nuns on the Bus, a traveling band of nuns pushing for political and social change. "But while influence, connections and leverage are all vital in the world of politics, I fear they can be toxic in the spiritual life. I am afraid that I am holding on to my notoriety for notoriety's sake. ... I am worried that my hunger for fame closes the door to the contemplative life that is at the core of the life I truly hunger for." MPR News host Kerri Miller spoke with Campbell as part of her new "Women of Faith" series. This conversation is part of a new series on MPR News with Kerri Miller, "Women of Faith." As women's voices in faith communities become louder, we're speaking with women who are energized by some of our most urgent policy, spiritual and philosophical questions. Use the audio player above to hear an edited version of their live discussion.